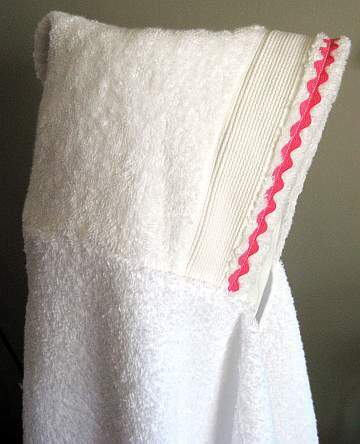 I made this hooded towel for Christmas for my little girl. 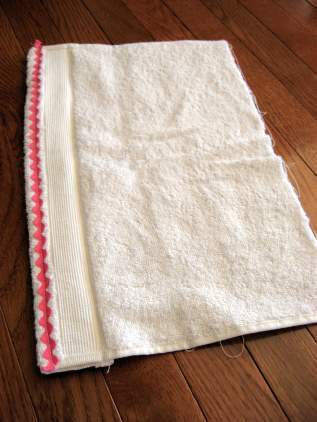 It is a really simple and quick project made from 1 bath towel and 1/2 of a hand towel. 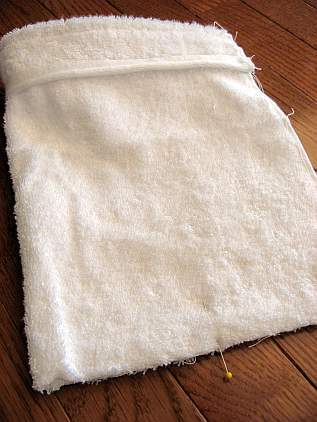 Fold over the finished edge of the hand towel. I folded down just past the ribbing. You want to have about 10 1/2 inches in finished length. Stitch down the edge. I stitched a little ric -rac to the front. 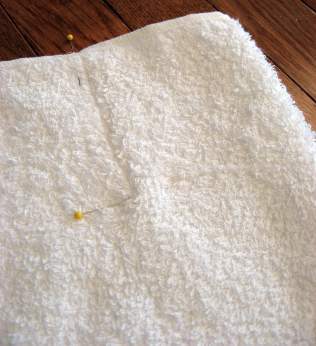 Fold hand towel in half right sides together, find the middle of the side and mark with a pin. Bring the folded edge into the middle. You may have to remove the pin while you adjust the towel. Stitch across the bottom edge making sure you catch all layers of the pleat. When finished stitching, zig zag or overcast your seam to prevent raveling. When you are finished the right side will look like this. 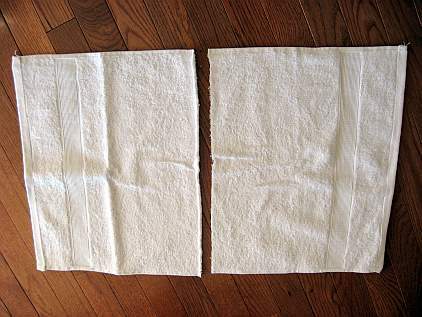 Fold the bath towel in half, right sides together. 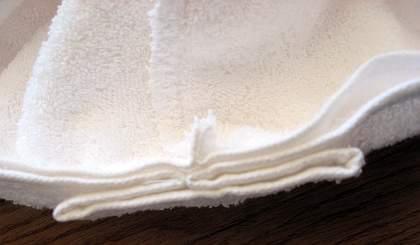 Measure over 3-4 inches from the fold and 3-4 inches down from the top and stitch. 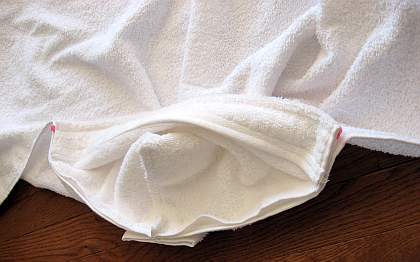 Open bath towel flat and open and flatten the tuck. You can baste across the tuck if you want. 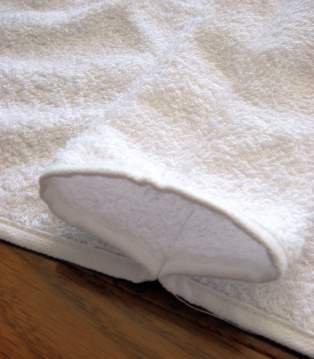 With right sides together, line up center of bath towel and center of hood. Now that it is finished I am wishing I had added another row of ric- rac or that I could find the darling pink towel with rainbow ribbing I originally purchased for this project! 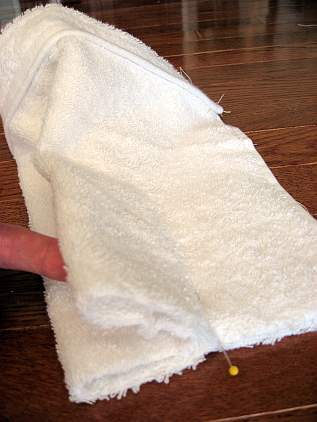 Great lesson in how to make a baby hooded towel. I have made about six as gifts and several more for people that liked the ones I made and wanted one for some of their friends. I have added different ribbons and lace trims to be creative. So much ! I received one of these as a shower gift for my 5th child. I had made them for many years, but after having 10 children I somehow didn't have the time. Now that my youngest is 6 I wanted to make a few for gifts. I lost the instructions and couldn't quite remember how to do the hood. After searching the internet for a while, I found this post. Thank you so much for the refresher. 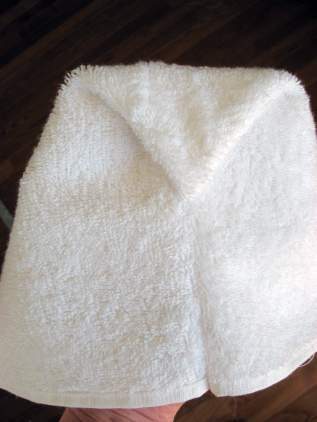 This towel has a cleaner finished look than most of the other tutorials online. I am not sure you need the dart gathering on the big towel, does it get too bulky? Would the instructions be similar for an adult sized hooded towel? I know my boyfriend has always wanted one but they're so hard to find!! thank you for the info, I was looking for details on it here since last weekend ! LOVE this tutorial! The pleat makes it so unique! I've made two for my daughter and they fit her head perfect. Thanks for sharing your talents! Thanks so much for an awesome towel pattern!! I've made several and they are SOOO nice. Great for my 4 mo old and my almost 4 yo - and will last for years to come! Love that it is a full size towel with a hood!! Agree with other posters - doesn't take very much time - maybe 30 min from start to finish. Thank you ! ! ! 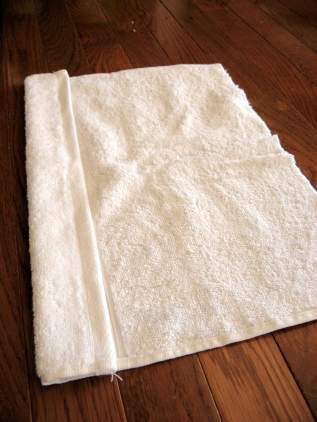 Could you iron on an applique to the towel or would it have to be sewn on? I'm with Denise. I had made many of these from the Home show. I got super busy and hadn't made any in a while, when I went to make one for a baby gift...I couldn't remember how. Had to practically tear one apart. Now I have printed directions!!! Just put it in with my craft items. Thank you! Thank you so much. I'm going to a baby shower tomorrow, and was able to make one during my kids' nap today. I am amazed at how fast and easy it was to make something look this good! Actually, I got half way through a second one (for my older son), but my mom called and woke the boys. Oh, well. I'm sure I can finish it easily during another nap. THANK YOU THANK YOU!! I lost my old printed directions for these off a TV show and many just show the old "sew a hood in the corner of the towel" kind. This is exactly what I needed! Love this idea! I have made some before, but this way is more simple and works great! I made them for older kids/teenagers and just used a whole bath towel, instead of cutting it in half, to make the hood bigger. 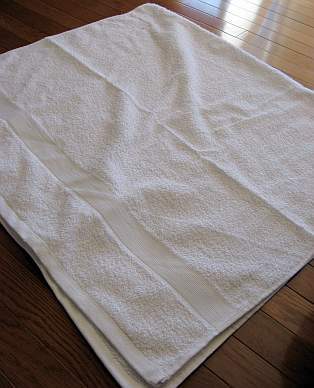 The long edge of the towel is what I folded over and added rick-rack. They look great! Thank you so much for the tutorial! I think what you have done here is great. I would like to use this pattern for my six year old grand daughters and I think the hood is going to be a bit small. Any suggestions on how to use all of the hand towel to make a bigger hood? Thank you. I was just going to embroidery on a towel for my nephew, but then came across this when I was looking for designs. What timing! Happy Holidyays. I just made these and they were so easy and came out fabulous!!! I stumbled across your site this morning and think that it is fabulous!!! Great step by step instruction!!! 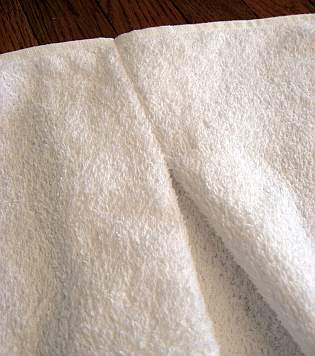 I have been making these same hooded towels for at least 20 years now. First saw them made on The Carol Duvall show, demo'd by a lady named Debbie I think. All the kids in the family had to have more than one. This is a fabulous tutorial! I will post a link on my hooded towel post! Thanks for leaving the link on my comment box! We'll share with our readers. Super cute ric rac. yay! Thanks so much. I made one for my sisters baby who will be born in november. The directions were very clear and easy to understand. Super cute! Hey I am going to make one of these for my daughter and son for Christmas but have 2 bath towels for making them. Wondering the size of the hand towel when cut. I might be able to make 2 for each of them by making the hood out of the other towel. So cute. thank you so much--I love this simple tutorial!! I'm going to be making these for all the kiddos I know this year! Hmmm... I wonder how I could make this for bigger people? Our indoor pool is really frisky in the winter, so going from pool into the frigid shower area could really benefit from this wrap. I'm thinking the hood is the main adjustment needing attention -- simply using larger/beach sized towels would suffice for the body. Thoughts? Should one use a small bath towel the same way for the hood for larger folks (adults, pre-teens)? Awesome! I love the pleat--a nice touch! What a great tutorial!! I have made these for baby shower gifts for years - but I use a washcloth for the hood. Works wonderful till they are about 2 or 3 then the hood is too small. How big is the hood on this one? I have thought of making one with a hand towel to make it bigger. My 7year old LOVES her hooded towel that is now way too small for her but she wont give it up. I would love to make her a new one with a big hood. A friend of mine used to buy towels in bulk when they went on clearance and put them away. She had lots of fancy baby ribbon, so she would always have something on hand when anyone she knew got pregnant. My wonderful, sweet friend made a hooded towel very close to this design for my child's birthday. We had him try it on to display. I could not hold back my laughter. I did not want to be tacky but I thought it looked like a KKK robe since it was white with the point at the top. Not that the KKK is funny or anything. Just saying. BTW - I thanked her repeatedly and apologized for my outburst. We used the towel until it no longer fit and was worn silly. This is a wonderful idea for a gift and so simple to make. Thank you so much for this tutorial! I have made so many!! It took me a while to figure out the first one but I have whipped out so many very fast after that first one! So cute and SO EASY!! Thanks again! I make these too but I line the hood with a bright fabric and put a half-moon hem across the crown instead of the fold. I just like rounded hood better. These are awesome gifts for all those little nieces and nephews! I just used this great tutorial. Thank you so much for taking the time. Stop over and see my handy hooded towel if you get a minute. This is fantastic. I love the pics, the descriptions, and instructions. I made this in a snap! Thank you. Thank you. Thank you. Such a wonderful tutorial, it really helped!! Thank You! This is so adorable and is a great idea for a gift! I love your other projects as well! I made three of these this weekend. Your directions were clear and easy to follow! Thanks for the super tutorial. Thank you for the tutorial! I just made one for my daughter and my husband was surprised that it did not take me too long to do it! Thank You again!!! I just made one of these for my neice and now that I'm done I wish I would have gotten more towels to make one for my son and nephew too!! Great tutorial and I love the added pleat and hood 'gusset'. I love this and will be back after Christmas to follow your tutorial. I could kiss you!! I have looked all over the place for this tutorial and don't know how I landed here. Thank you so much for posting this particular tutorial. It is just what I have been trying to do and needed to double check some details. You are fabulous!! Thanks for the tutorial. I always loved receiving these as gifts for my kids. Now I can make them for others. Thanks for visiting my site - you almost made me cry. Seems like you miss Germany a lot, all of the things you mentioned I love too. To cheer you up you should probably think about the old saying that the grass is always greener on the other side. Your ideas are great, I bookmarked your crayon roll, that's probably how you came to visit me?! Thanks for the tutorial, I'll send you a picture whenever I get to do one. i have wanted and wanted this EXACT tutorial. too lazy (or busy, maybe) to try it on my own...so thanks! my 5 year old girl still loves those hooded baby towels, but they are all so small on her! i told her i'd make her some new ones...now i know how! thanks! Very cute! Thanks for the tute! 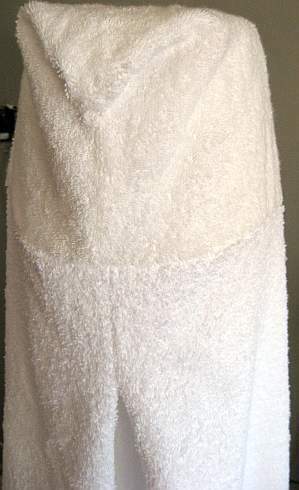 love your hooded towels....i make my a bit different...i use wash cloths. I know what my daughter's getting for Christmas! Woohoo, you're back! I knew you'd have some awesome gift ideas! Thank you! This is great! The easiest way I've seen this done by far. I have plenty of little nieces and nephews that will love these. Great idea! Wonderful tut, I am going to try it as well. Thanks for sharing it with us! What a wonderful Tutorial! I'm going to try it for my son! This makes such a great gift. Thanks for the tutorial.